TRIBUTES are being paid to the drummer of Nottingham band Little Barrie Virgil Howe who died suddenly died on Monday night aged 41. The news comes just as the band were set to embark on their UK tour in Cambridge. Dad-of-one and son of Yes star Steve Howe, Virgil had been in rehearsals preparing for the tour. Virgil's sudden death has come as an incredible shock to his friends and family. 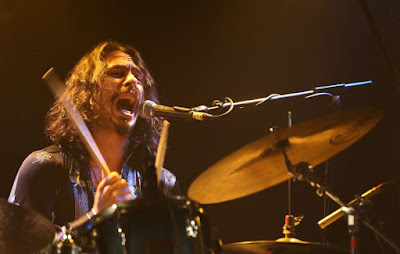 Little Barrie front-man Barrie Cadogan lead the tributes: "We are heartbroken that we have lost our dear friend and brother Virgil Howe. "Our thoughts are with his daughter, family and partner. "Please respect their privacy during this difficult time." In a statement released by Yes, they said that they will be cancelling the rest of their Yestival tour:"Due to the tragic, unexpected death of guitarist Steve Howe’s beloved younger son, Virgil, YES regrettably announces that the remaining dates of their Yestival Tour have been cancelled. "Ticket refunds for the affected tour dates (in Moorhead, Cedar Rapids, London, Rochester, Boston and Huntington) will be available at point of purchase. "YES — Steve Howe, Alan White, Geoff Downes, Jon Davison and Billy Sherwood — want to thank all their fans for their support and understanding at this time. "Steve Howe and family ask for their privacy to be respected during this difficult time." The band were scheduled to play Liverpool's Studio 2 on September 21. Tickets for the tour will be refunded from their point of purchase.